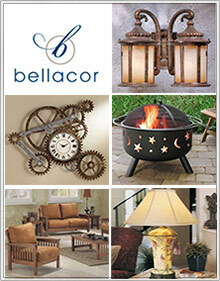 Highlight your home with affordable lighting, decor, furniture and accents, from Bellacor Lighting & Home Furnishings. Lighting - Allow Bellacor to light up your home for less, with affordable lighting styles for every room. Shop thousands of styles of interior and exterior lighting fixtures that will highlight your kitchens and kid's rooms, bedrooms, bathrooms, dining rooms, outdoor patios, and every area in between. Choose from brilliant ceiling lights and chandeliers, recessed and track lighting, pendant lighting, wall sconces, outdoor lighting, lamps, specialty energy saving lighting, and more contemporary home lighting options that are practical as well as stylish. Decor - From primary lighting to the little accents that make a house a home, Bellacor Lighting bathes your home in warm light and decorates every room with warm decor elements. Dress up bare walls with mirrors and wall art, create cozy spaces with throw pillows and fireplace accessories, and add interest to your interiors with clocks and candle holders, decorative bowls and baskets, planters, fountains, statues and ceiling fans. Furnishings - Furnish your home with statement making furniture pieces that will fit every decorating style and budget. Define your living spaces with area rugs, chairs and accent tables, maintain an organized home with cabinets and chests, benches, modern media stands and storage pieces. Bellacor will enrich your home with over 300,000 affordable lighting and decor products to choose from. Shop by style or theme for a streamlined look, or mix and match pieces to create your own signature style. Kitchen - Make the kitchen of your dreams a reality, with Bellacor's extensive selection of kitchen accessories and hardware. Besides an impressive selection of kitchen friendly pendant and recessed lighting, you'll also find discounted kitchen sinks and faucets, cabinet hardware and knobs, dinnerware, drink ware, flatware and barware. Make kitchen life simple with kitchen islands for extra workspace, and hanging pot racks for extra storage. Bed & Bath - From super soft sheets and blankets to duvets, comforters, pillows and bed skirts, Bellacor brings you all of the bedding basics you need to brighten every bedroom in the house. Make over your guest and master baths with Bellacor lighting for the bathroom, with thousands of light fixtures to choose from. You'll also find a variety of bathroom furniture and accessories, from sinks and shower heads to bidets, bath faucets, and more. Outdoor - Enhance your patio, deck, yard, or garden with a variety of outdoor lighting, furnishings, and decor that will transform any outdoor living space into a relaxing retreat. Trim your terrace with outdoor and patio furniture for dining, lounging or entertaining, available in a wide range of styles, colors and finishes. Illuminate your yard with the perfect landscape lighting, outdoor lamps, ceiling and hanging lights. Embellish with little outdoor touches, from quaint bird baths and wind chimes to mailboxes, sundials and fire pits. Bellacor Lighting & Home Furnishings has provided home decorators on a budget with access to the world's top home furnishing brands and designers at up to 75% off retail.